**Average data pulled from more than 2200 CAKE restaurants. IBISWorld estimates holiday spending to grow 1.7 percent to $20.1 billion in 2018, topping its historical record. Driven by high levels of per capita disposable income, consumers are more likely to splurge a little more on gifts for their special someone. The average shopper is expected to spend $151.98 on holiday indulgences. According to the National Retail Federation (NRF), a larger share of the U.S. adult population will celebrate Valentine’s Day this year, with an expected 54.7 percent participation rate, up from 53.9 percent in 2017. With the holiday falling in the middle of the week, fewer consumers will have the time to celebrate with a date night, contributing to a 0.3 percent contraction in spending on a celebratory night out. Fewer big dates this Valentine’s Day will contribute to an expected 0.8 percent decline in revenue for buffet restaurant sin 2018, as well as slow 1.1 percent growth in demand for premium steak restaurants for the year. 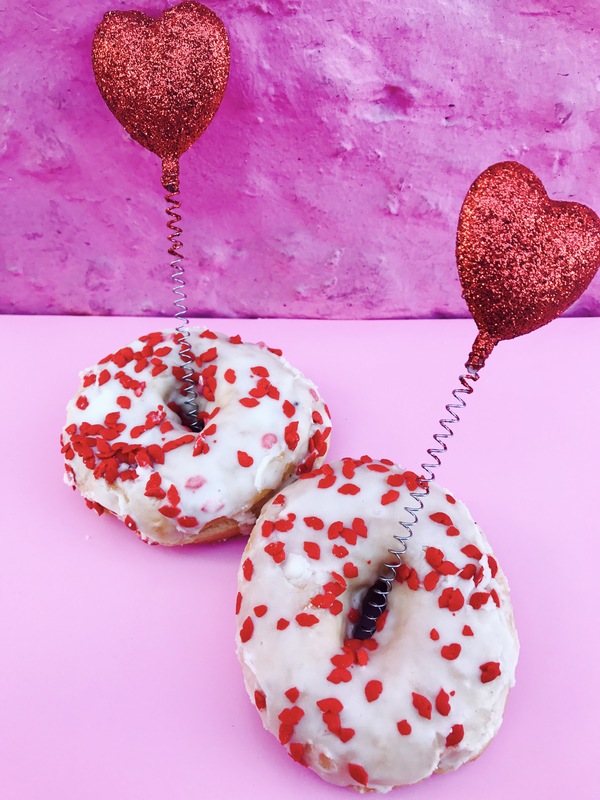 Here’s a roundup of some unique restaurant promotions for Valentine’s Day. 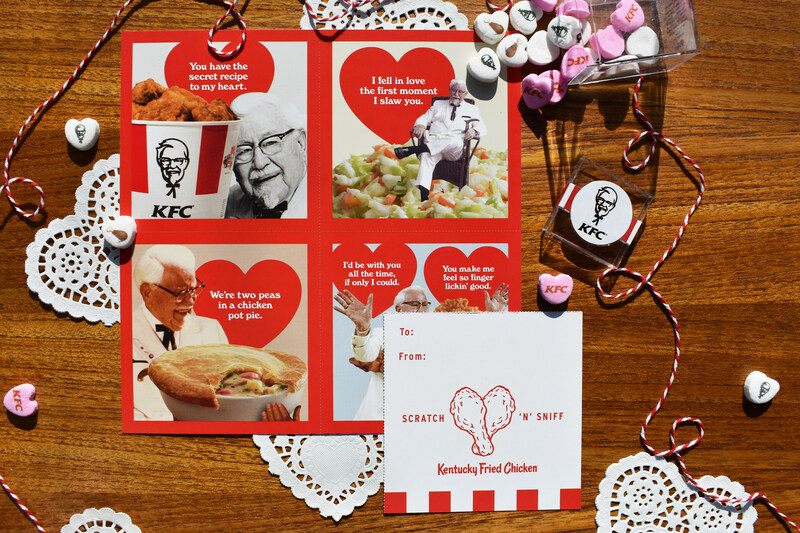 KFC wants you to show your loved ones how much you care by giving them a fried chicken scratch ‘n’ sniff Valentine’s Day card featuring its iconic founder, Colonel Harland Sanders. Available in participating KFC U.S. restaurants, KFC’s set of four retro-inspired valentines romantically combine tender love lines with the intoxicating scent of fried chicken. When paired with a $10 Chicken Share, perfect for two, KFC is America’s one-stop shop for Valentine’s Day. For those who are more digitally inclined, KFC has partnered with Tenor, the largest mobile GIF search engine, to create a series of animated KFC valentines for sharing with friends and family in messaging apps. KFC’s limited-edition valentines are free, while supplies last with the purchase of a $10 Chicken Share. 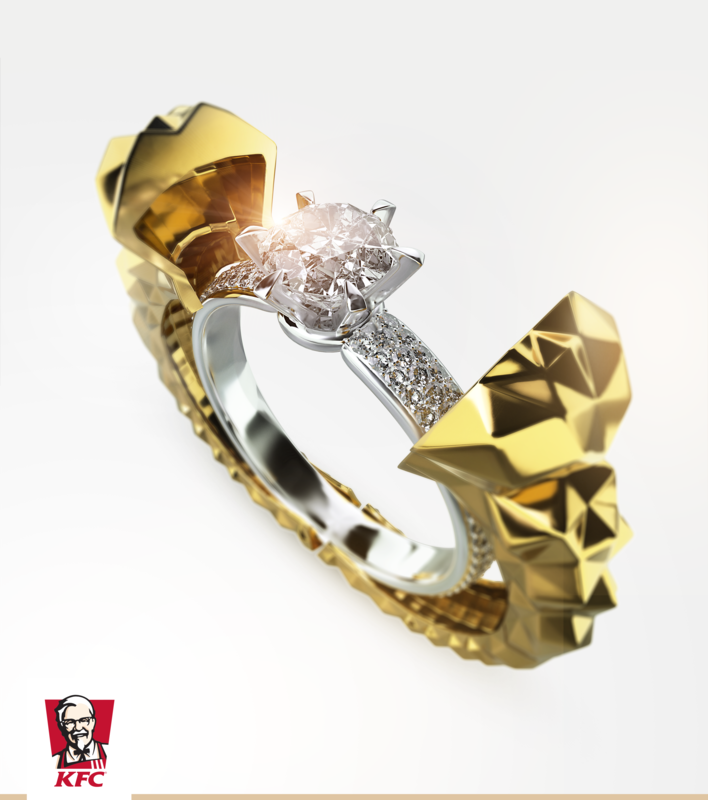 KFC in Poland surprises its fans with its latest release, a specially designed engagment ring in light of Valentines Day celebrations. The food supply chain claims that if fans met at a KFC restaurant, went there for a first date, or perhaps were brought together by a fierce passion for “juicy fried chicken” then the occasion deserves an unusual celebration. This loveful ring will consist of two parts: first, the external layer made of gold with a fineness of 750, which will make fans think of a crunchy coating. Like the original KFC coating, which covers pieces of juicy chicken, its golden copy will boast some truly ‘exceptional’ elements. Inside is an engagement ring, platinum with a fineness of 950, set with nearly 150 small diamonds. That’s not all, as the whole is crowned with a 0.7 carat diamond. The global food chain says the special piece of jewellery is not to be missed by KFC fans who want to show their love to their significant other. KFC are yet to confirm any details ahead of the big release and the conditions for receiving the ring. According to KFC, couples who decide to tie the knot with the engagement ring can expect a special wedding surprise from the restaurant chain. Schlotzsky’s hot sauce. Bake according to instructions on box. hmallows, sprinkles and/or your favorite candy. Using a fork, pinch the brownies once they are cooled. 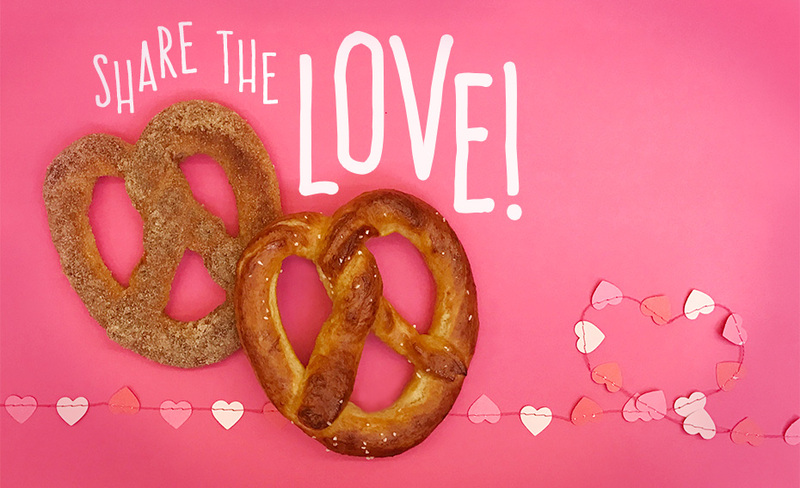 Original and Cinnamon Sugar Heart-Shaped Pretzels will be available at Auntie Anne’s nationwide on February 14 To help further spread the love, Auntie Anne’s is offering a Heart-Shaped Pretzel Buy One, Get One (BOGO) promotion for all My Pretzel Perks members. McAlister’s is offering free kids meals for each adult meal purchased by you and your boo. On February 14, participating McAlister’s locations are offering up to two complimentary kids meals with the purchase of an adult entrée for all guests that dine in. Guests can also keep an eye out for a complimentary surprise treat available for all loyalty members. Beef Jerky Outlet has debuted the Beef Box Bouquet just in time for Valentine’s Day. Each bouquet is presented in a unique beer can shaped glass with a special red koozie wrap. 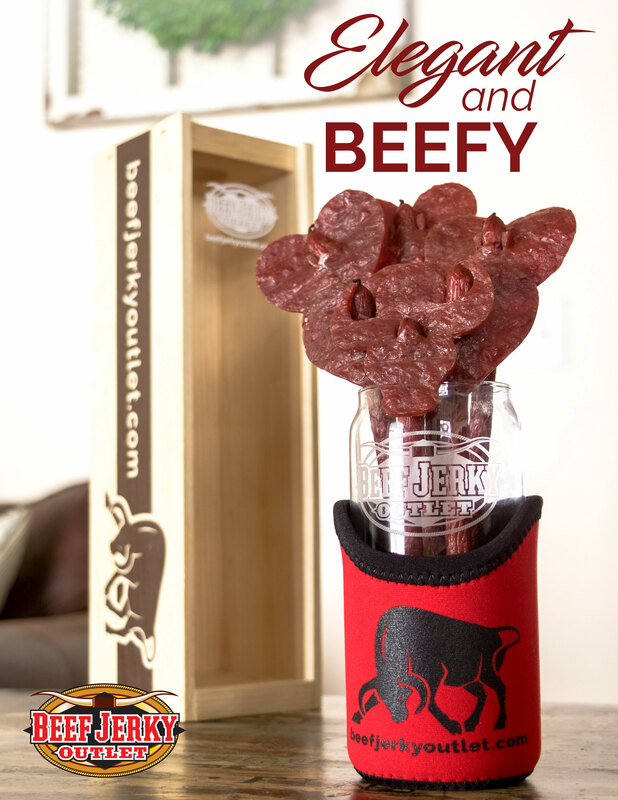 The bouquet is made up of Beef Jerky Outlet’s Original Flavor Snack Sticks topped with heart-shaped Original Recipe jerky “petals” and one in the shape of the iconic Beef Jerky Outlet Bull. The finishing touch is that it all comes packaged in a beautiful wooden “Keeper of Drinks Remembered” cap and cork catcher that lets a couple save mementoes of their special memories together. Wingstop Restaurants Inc. opened the phone lines of a limited time, Valentine’s Day toll-free hotline designed to help those looking to step up their romance game (and cure their hunger pains). 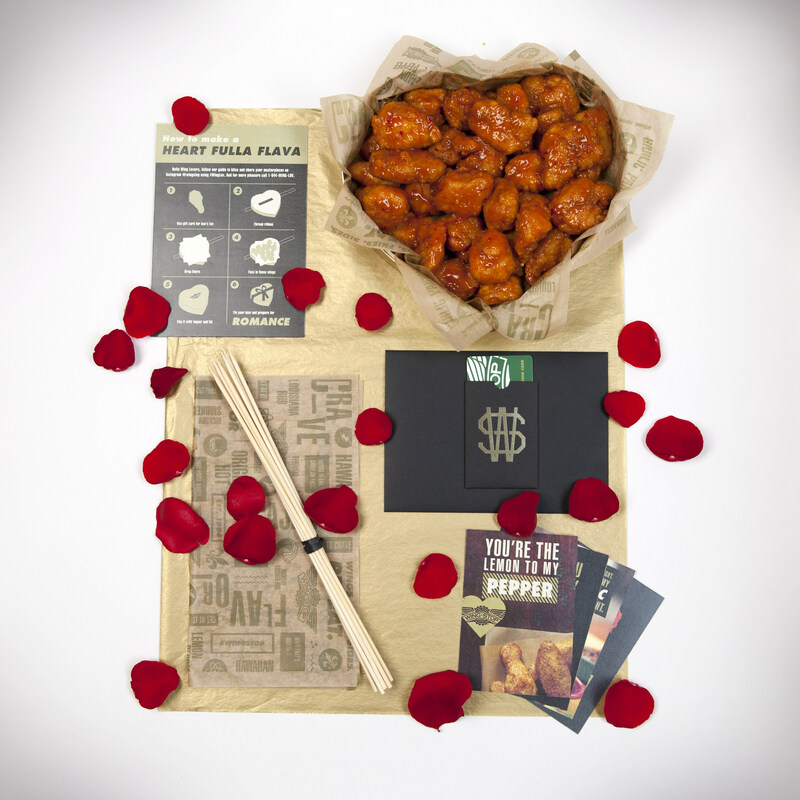 Whether you want to keep yourself out of the doghouse or have simply “been there, done that” with teddy bears and roses, celebrate the day of LUV with Wingstop on your lips and call 1-844-WING-LUV (or 1-844-946-4588) now. Valentine’s night pro tips, Press 1. A vocal warm up routine, Press 2. Wing presentation advice, Press 3. Exclusive access to the Valentine’s mixtape, Press 4. Just listen to your hotline rep talk saucy to you for a while, Press 5. When callers are overcome with craving, they simply Press 0 for information on pre-ordering their WING LUV kit. Each kit contains a heart-shaped wing box (chocolate is overrated) and all the romantic essentials necessary to make the perfect wing bouquet: skewers for wing “roses,” decorative cellophane, tissue paper, ribbon and DIY instructions. 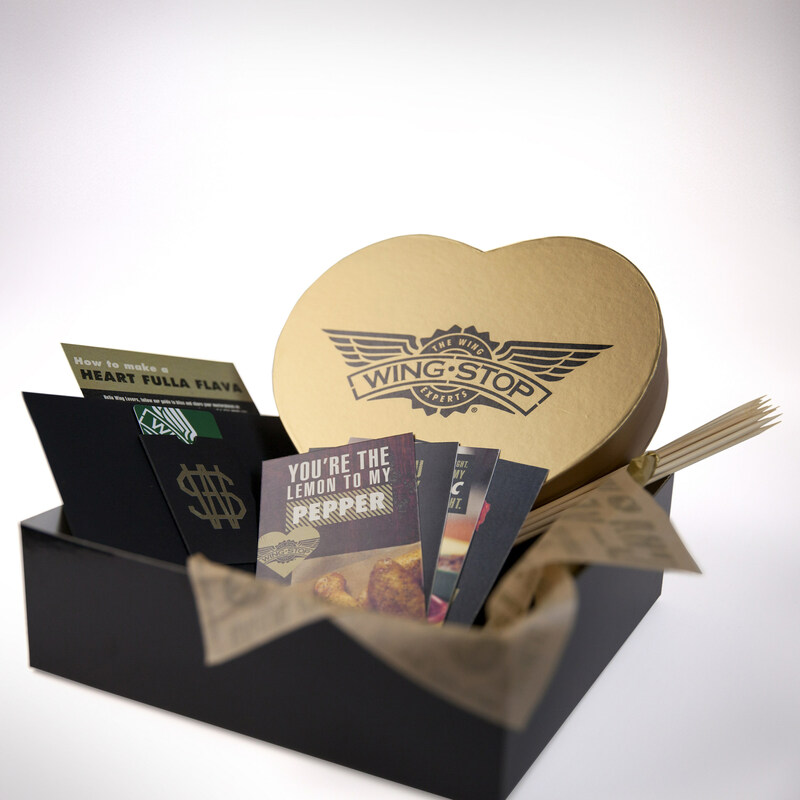 Plus, no kit would be complete without a $25Wingstop gift card and gift card holder, and four unique Valentine’s Day cards to help bring the sweet heat on February 14. Gordon Biersch Brewery Restaurant is giving couples a lot to toast and celebrate this Valentine’s Day. Guests can purchase “A Year Crafted with Love” certificate books featuring a year’s worth of dates for a special price of $75. The book includes 52 vouchers for guests to enjoy a “date night” at Gordon Biersch with one starter dish and 2 glasses of wine or beer every week in 2018. To celebrate the brewery restaurant’s 30th anniversary and love for craft beer, now through February 25, guests can also enjoy Gordon Biersch’s house-brewed beer for only $2.50—the same price they sold for when the restaurant first opened in 1988. Coconut Shrimp – crispy fried coconut shrimp served with grilled pineapple & mango salsa & drizzled with sweet Thai chili sauce. Cheese Curds (Taster size) – white cheddar cheese curds lightly fried & topped with candied bacon. Served with a creamy bacon dip. Asian Chicken Bites (Taster size) – crispy chicken tossed in teriyaki sauce with chilies & green onions. Served with a lemon glaze. Woodford Reserve Bourbon® Grill – your choice of Chicken or Salmon with Woodford Reserve Bourbon® sauce, quinoa-kale salad & choice of side. Char Grilled USDA Choice Top Sirloin – your choice of 7oz & 10oz & two sides. Top with your choice of sauce: mushroom beer, red wine reduction or Gorgonzola garlic. 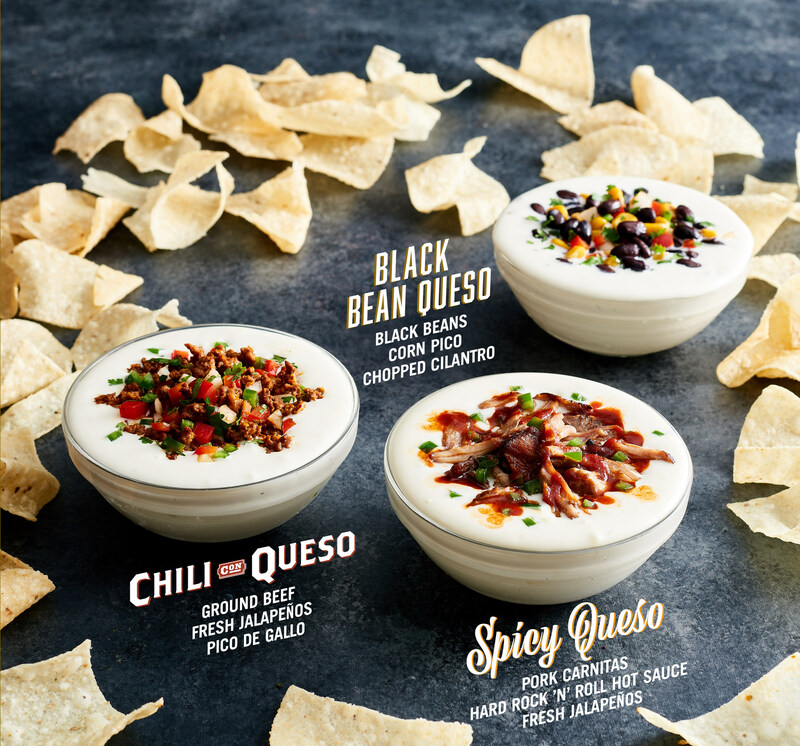 Moe’s Southwest Grill® announces its latest menu innovation: three mouthwateringly delicious, brand new queso flavors, available at all locations nationwide. The Southwest-inspired menu items include Chili Con Queso, Black Bean Queso and Spicy Queso. Each queso flavor is created in-house by adding fresh ingredients to Moe’s Famous Queso – it’s like adding diamonds to liquid gold. 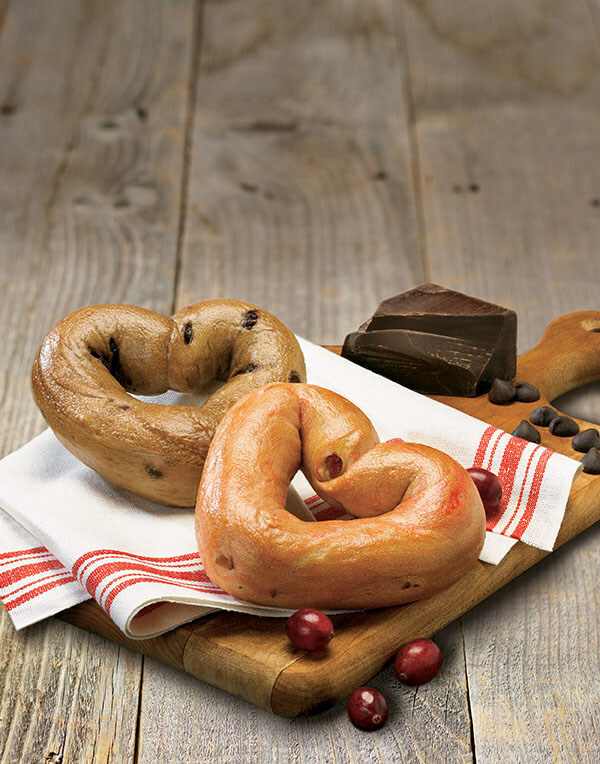 Einstein Bros.® Bagels is inviting guests to delight those they love with a box of heart-shaped bagels. They are available in flavors of Chocolate Chip, Cranberry and Plain. 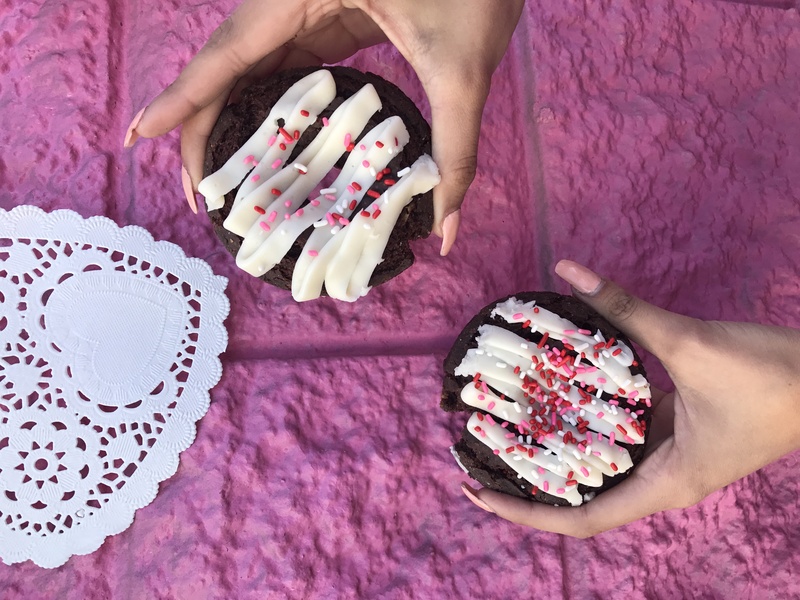 For last-minute purchases on Valentine’s Day, the company will offer heart-shaped bagels in the popular Chocolate Chip flavor for drop-in purchase. Sparks will be flying this Valentine’s Day, thanks to a love connection between TGI Fridays and Pocky. 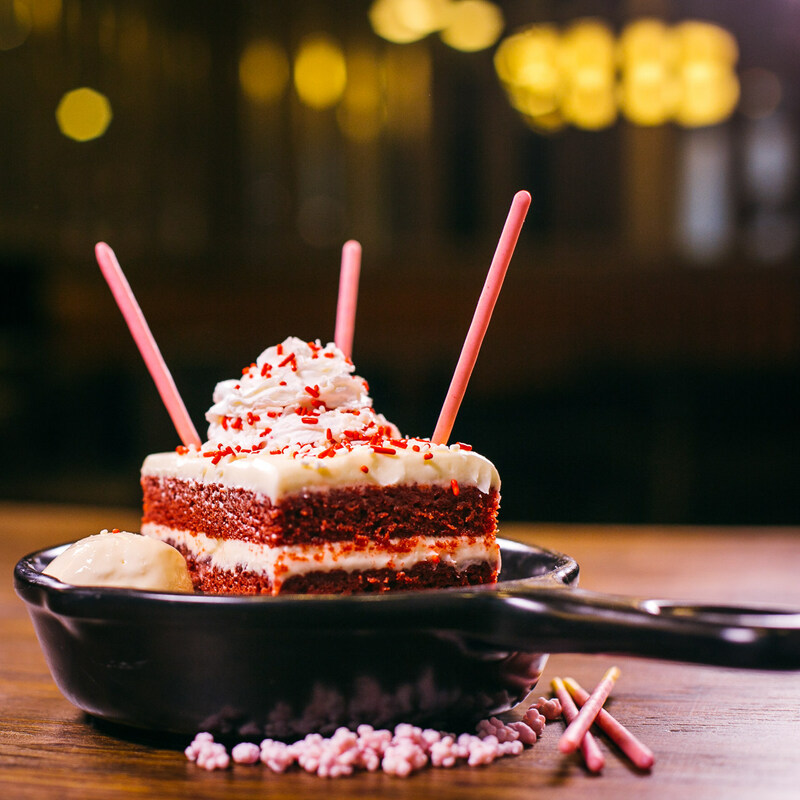 The casual dining chain has collaborated with candy snack company Ezaki Glico USA to introduce Red Velvet Sparkler Cake, a decadent dessert creation that recently debuted on TGI Fridays’ menu. This is the first time Ezaki Glico USA has collaborated with a major national restaurant chain since expanding to the United States in 2003. Fleming’s Prime Steakhouse & Wine Bar is partnering with a jeweler to provide a one-of-a-kind Valentine’s Day experience. Guests can indulge and celebrate their love with dinner for two, a bottle of premium champagne and an exquisite pendant. For guests looking to elevate their evening and spoil their Valentine’s with an extravagant surprise, Fleming’s is offering a $500 package that includes the prix fixe dinner for two, a bottle of Veuve Clicquot served tableside, and a memorable gift to take home — a stunning pendant from a luxury Fifth Avenue jeweler. “We’re offering an unforgettable Valentine’s Day celebration with an exceptional, all-inclusive evening that guests won’t soon forget,” said Beth Scott, President of Fleming’s. 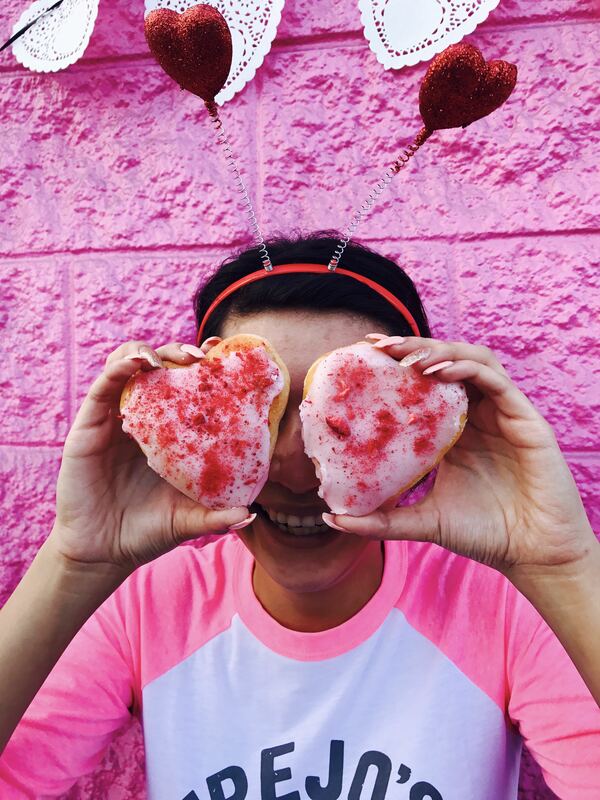 On Feb. 14, all Dutch Bros locations will celebrate Valentine’s Day with their annual Dutch Luv campaign, which involves nearly 300 locations across seven states donating $1 from every drink sold that day to a local food bank. 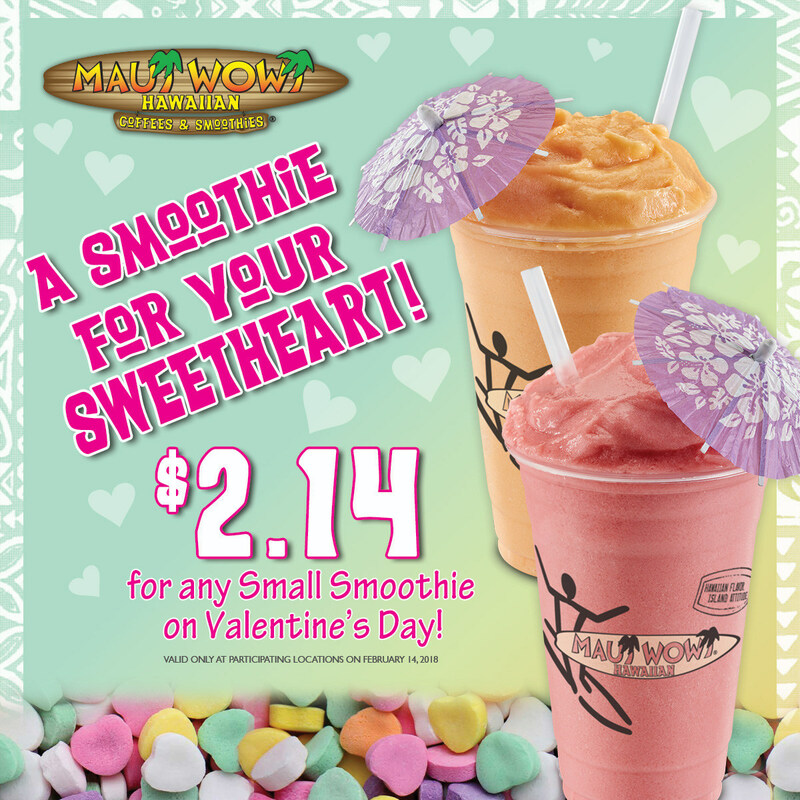 Maui Wowi® Hawaiian Coffees and Smoothies is bringing back its Valentine’s Day deal, offering its fruit smoothies for only $2.14 that day, available at participating retail locations. With the brand’s average small smoothie price coming in at $3.99, treating yourself to a small smoothie will be nearly half off. All Maui Wowi smoothies are naturally gluten-free and packed with deliciously healthy ingredients like bananas and live-cultured, probiotic yogurt. Customers can order traditional smoothies like Strawberry, Mango Orange or Piña Colada or choose from a list of other specialty blends like the Hawaiian Dreamsicle, Tropical Sunset, and Wistful Waikiki, which combine two classic flavors for a refreshing new taste. Originally known only to fans of the TV show “Parks and Recreation,” Galentine’s Day, the day before Valentine’s Day where ladies celebrate ladies, has become an annual cultural event. Since it falls this year on a Tuesday, Taco Tuesday, a number of restaurants are hosting promotions. El Torito decided to celebrate it as only they can. $2.99 Tacos. Choose from Steak, Chicken, Carnitas and Fish Tacos made with handmade guajillo chile tortillas. Select from a variety of salsas, nopalitos salad, cabbage/lettuce mix and cheese. Also available are complimentary Frijoles de la olla, potatoes and El Torito’s signature Sweet Corn Cake. This will be served from 3p.m. to close in the Cantina at all locations. All nine locations of Acapulco Restaurant and Cantina will offer $3 Tacos from 3 p.m. to close. Choose from Al Pastor, Shrimp, Chicken and Carne Asada made with handmade tortillas. Select from a variety of salsas, cabbage/lettuce mix and cheeses. Also enjoy a Beer and a shot for just $4. Pink Taco is celebrating from 4 p.m. to close at 8225 Sunset Blvd., West Hollywood, California.